Discussion in 'Downhill & Freeride' started by NY_Star, Dec 24, 2007. Here&#8217;s a picture of the first production Primer 220 (Red Wheels) next to an original prototype (Black Wheels). Notice the hydroformed top and down tube on the production bike. The bikes are currently being tested by Tomac Factory Team Manager and World Cup rider Claudio Caluori and superfast Swiss Junior Robin Hagen, a member of next year&#8217;s Tomac World Cup Squad. Maybe have to change the name from Tomac to TomX...? can't see any pics, is it normal?? Not sure I like it any more. Pretty much an Cruz ripoff. Even the toptube screams SC. Beat to the punch, guess I was to busy watching pron. Even the toptube screams ample knee clearance. What were the FEA results for the hydroformed TT and DT vs. the regular tubing? I'm assuming better torsional rigidity, but that's just a guess. ?? Other than the little section of the top tube that looks sorta nomad-ish, what else makes it a santa cruz ripoff?? i like it. anyone have a closer pic of the linkage? is it 1.5? Later this week i will have some pics more picks of a bike that is getting built up for a Mountain Bike Action review. Yes it is a 1.5 headtube. Just because it is Hydroformed does not mean it is a Santa Cruz rip off. Awesome. Cannot wait to have mine. Wrong part. I'm 5'7", I FULLY understand low standover, and it's nothing new. It's the hump at the headtube junction I don't like. Not as Quasimoto'd as the SC, but it's still there. Didja ever think that maybe that bump allows Tomac to flair out the headtube joint and eek out a little extra weld area on the headtube, making it stronger overall? That's function forming in my book. Uh yeah, that's what I just ****ing said! Get it? FORM...follows... FUNCTION?! I'm only pointing out the asthetic issues that I don't like. 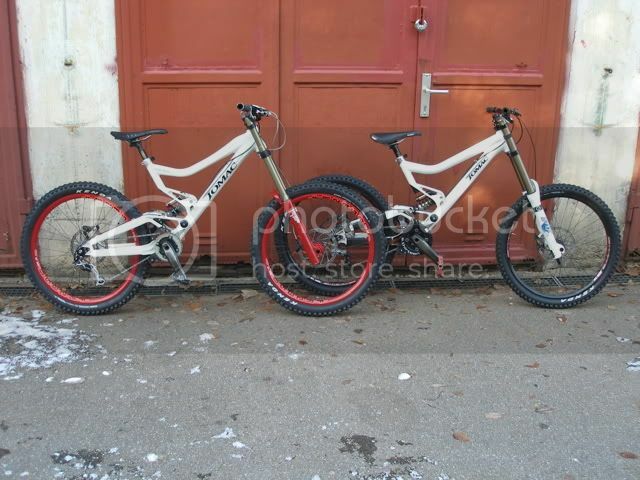 The performance of a Tomac bike isn't really even an issue open for discussion. Now don't they have a full-awn DH rig comin out, too? Or is this the slimmed down end result? I remember seeing some pics/video of it, but never bothered following it's production progress as...well...I don't consider what I ride worthy of that bike! what are the specs on this frame? So what is the rumored price of the 220 frame? BB and seatpost size would be useful info also. Regarding the top tube shape, I think the bump is a little accentuated because the bars are turned slightly. In reality, it looks like slightly less of a hump than the picture shows. Nonetheless, the shaping was done for good reason: the head tube impact test showed that the flat section on top added strength and weld area, which in turn allowed us to eliminate gussetting between the head tube and down tube (MobileChernobyl had it right above). Besides the fact that the elimination of the gusseting improves the looks a bit (please note the lack of excessive welding in this area), it was also a bit of a technical accomplishment and lessened overall frame weight. In addition, the top and down tube shapes really enhance the front end stiffness of the bike. The head tube size is 1.5, and is somewhat related to the above. The 1.5 provides increased/improved weld area. BB is a standard 83mm and the rear end is 150mm (hex axle on one side, axle is supplied). Price for the frame is $2599. Don't take my comments as smart--- I like the bike, I like the top tube, clean looking machine, if I could order the frame with a matching white 40rc2 I would put my money down now. I would rather hear a report from Decline then MBA but that is me. Seatpost size is 30.9, ICGS 05, fits up to 2.7 tires, shock is 9.5X3 (stock shock will be the Fox DHX 5.0). Let me know if I missed, or miss anything. The MBA test bike is getting built up this week so they are going to be testing it. I like the prototype more. Has Johnny T tested it on the Kamakaze yet? slick... i like the looks for sure. 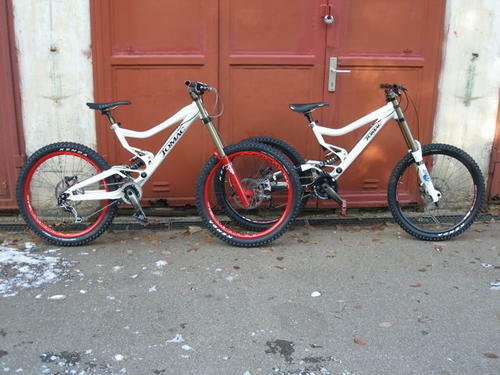 nice clean lines & great technology... just what i think of when i hear the name TOMAC. I don't recall the weight being stated, but i wasn't playing that close attention! lol i can't imagine it weighig as much as it's predecessor... The frame price is reasonable as well (considering it's competition)... that was one big issue back in the day when its the old rig retailed for about a grand more. regarding the "hump".. never really been a fan of it's appearance... but understand the concept behind it, & like Joel stated, it might be more noticable because of how the photo was taken... regardless, it's not as big as the SC line. but even that grew on most of us. ...but then you wouldn't hear about it's climbing characteristics! Let's hope the company takes a similar route as Yeti now that it too is independtly owned again! grounded by it's heritage & love for racing...but not afraid to push the limits either! Wheelbase for small is 1152(45.35 inches), medium is 1171mm (46.10 inches) and large is 1193 (46.96 inches). Frame weight is 11.5 pounds. No test on the Kami yet, but I think Johnny will go to Japan next year and race a pro Japanese national on it. Leverage ratio is 2.9 to 1 and the suspension rate is progressive up to 140mm travel and then becomes virtually linear. We did this because as you go into the travel, the rear shock itself becomes more progressive. 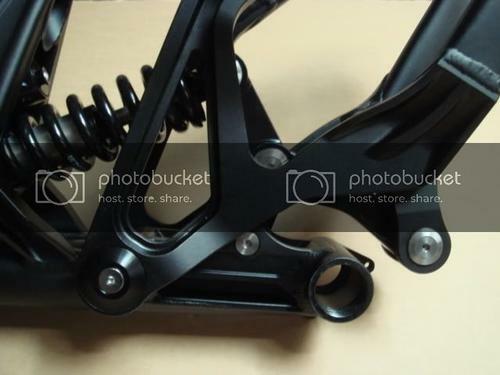 If the bike&#8217;s ending suspension rate is progressive, and the shock is progressive, deeper in the travel the suspension will both become overly firm and the bike will not achieve full travel.